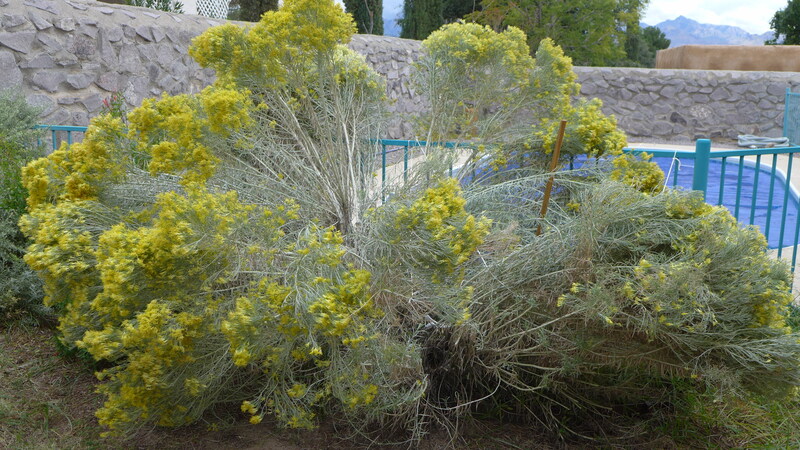 This post is about what’s new and what’s not so new in my garden. 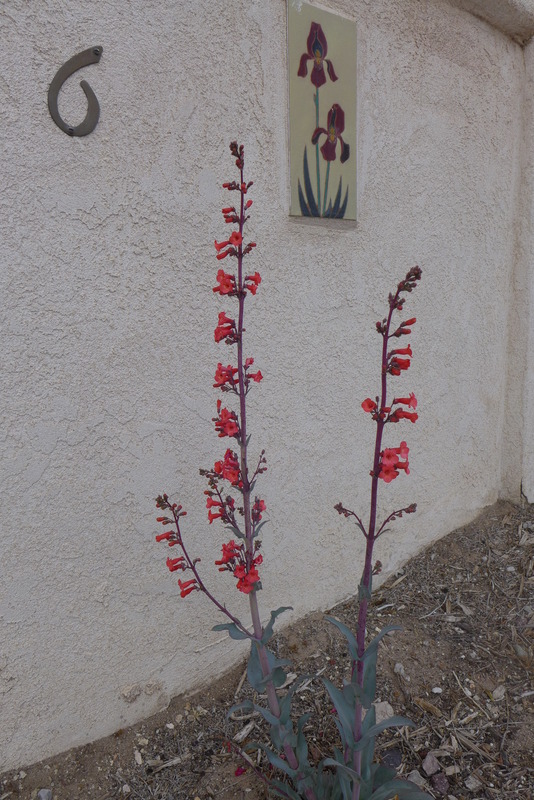 This past year I added two Penstemon superbus plants. One did not make it through the fall and winter. This 50 percent ratio is typical of my efforts in the garden. But the one that has survived makes me want to try again. 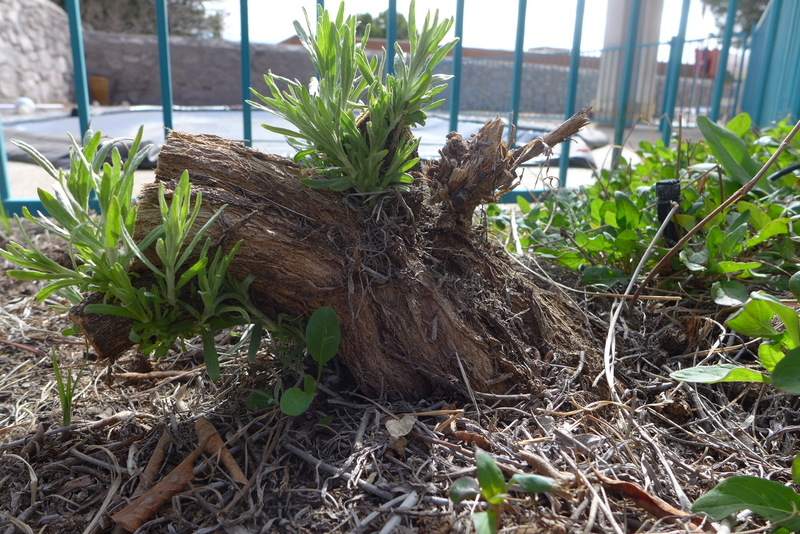 This winter I cut back the out-of-control chamisa, as close as I could get to the ground. I thought perhaps it would give up. As you can see, it did nothing of the kind. 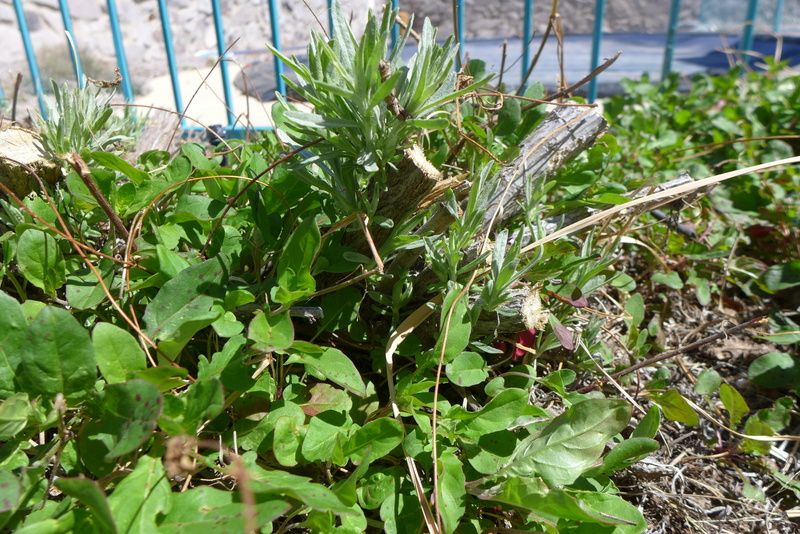 I can only hope this growth will be thicker and sturdier than last year’s, when I did not cut it back far enough. The plant growing around the stumps is Mexican primrose, which has spread as if it, too, thought the chamisa was not coming back. But what is this little blue and white flower? 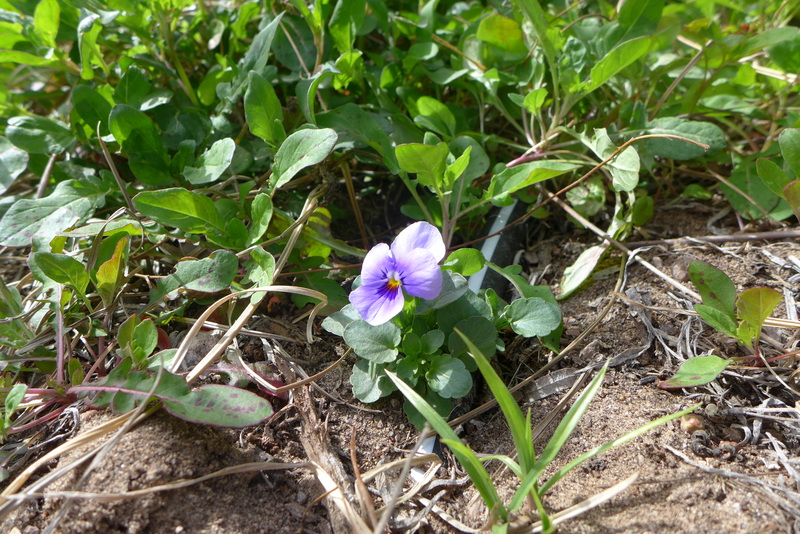 It’s a pansy from a seed that wafted from another part of the garden. I am delighted when nature adds its own touches to my efforts to work with plants. I can pretend we are a team, though I know I have much still to learn. How wonderful that spring is so far along where you are! In Michigan, we still have patches of snow in the shady places, and my snowdrops are peeking up about a half-inch. I am still working on my New Year’s Letter, so I’m not quite ready for outdoor responsibilities in any case. Thank you for sharing your garden with us all. The penstemon is beautiful – I can see trying again. Each time I read a blog post from you, I am encouraged. I see hope and receive strength to keep going the my chosen route. Especially the first two pictures spoke to me of surviving. One of your Penstemon didn’t make it, but one did. It survived the hard winter. The Chamisa that you pruned close to the ground reminds me of how important pruning is not only for plants but in our own lives. And in all of that pruning and waiting with expectation to see what would bloom, nature allowed a beautiful heavenly gift to come up that you had not planted, and that is the something new that gives people courage to move further. I like your post. It is Saturday morning here and as you can see, your pictures and your comments encouraged me greatly and made me think. Thank you for the comments, Sally. Patricia, you are a wonderful careful reader and commentator. Sandy, you get the prize for most faithful commenter. I’m glad to have you all as blog friends.